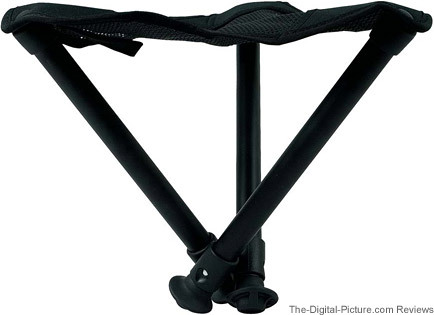 If I have my monopod with me, my Walkstool Comfort Folding Stool is probably along too. My primary monopod use is for sports photography and for sports photography, I prefer a low shooting position (keeps the photo background as out-of-focus as possible). A low shooting position means sitting directly on the ground (which is often wet or dirty - a dirty backside is not the image any photographer wants to portray) or squatting in a position that quickly grows uncomfortable (and renders the lower legs asleep). A couple of years ago, after a long search, I stumbled across the Walkstool Comfort Folding Stool. It is the perfect solution for my needs. While the Walkstool can be used in the fully-extended position as shown above, I prefer to use it in the semi-folded position as shown below. 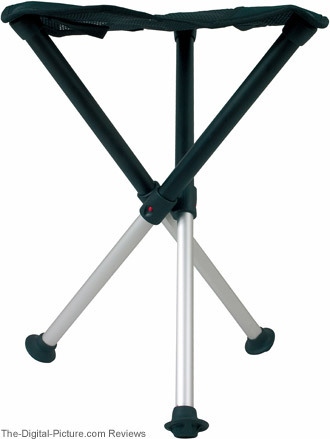 In this position, the Walkstool essentially becomes a person monopod. I sit on the stool brace my elbows on my knees, brace my monopod in a vertical position against one knee and then pivot on the stool as I track the action. I find this position to be very stable and very comfortable (both are important for good image quality). Since the stool is very small and light, it is easy to change positions at the venue. Only one hand is required for semi-folded use - I carry the camera and a large lens in one hand and the stool in the other. When finished with the Walkstool, snap the strap closed (I can also do this with one hand). It will attach to a belt, it carries in the supplied bag (older models did not come with one of these), or, because it is so small, it can easily pack into another camera bag. You might want to put a small plastic bag around the feet prior to packing if they are dirty. 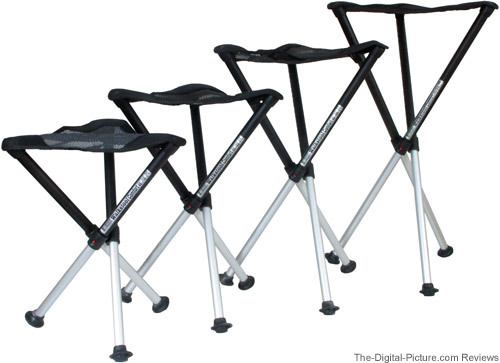 The Walkstool comes in different sizes as can be seen in the comparison chart below. I suggest you pile large books or other similar person-accommodating items on the floor to determine the height that is right for you. FWIW, I am 6', 170 lb and have the 18" (45cm) model. Notice the weight rating on even the smallest Walkstool Comfort model. Impressive - Most of us are not going to exceed that. Here is a larger look at the Comfort Stool models. The build quality of this stool is very good. Primary construction materials are commercial grade anodized aluminum and heavy-duty nylon used for the mesh seat. It feels like it will last a very long time. The Walkstool Comfort Folding Stool even looks professional. The only Walkstool problem I encountered was the rubber feet coming off (which is indeed problematic). I'm sure the reason for this problem is my unconventional use of the stool - pivoting and rotating it while sitting on it. After applying healthy amount of liquid nails to the inside of the rubber feet, this problem has disappeared. The Walkstool is not exclusively a photography product. There are an amazing number of uses for this stool around the house, on vacation or at work. I have not been writing many accessory reviews recently, but a friend came up to me at a recent soccer match. He was excited about what I was sitting on - not the Canon EOS 7D and Canon EF 300mm f/2.8 L IS USM Lens I was using at the time. So, based on his excitement matching my love for the Walkstool Comfort Folding Stool, I felt I needed to share this piece of gear with you. My guess is that you also have a use for one or two of these. A Walkstool also makes a great and unique gift.